You do business. We do the rest. 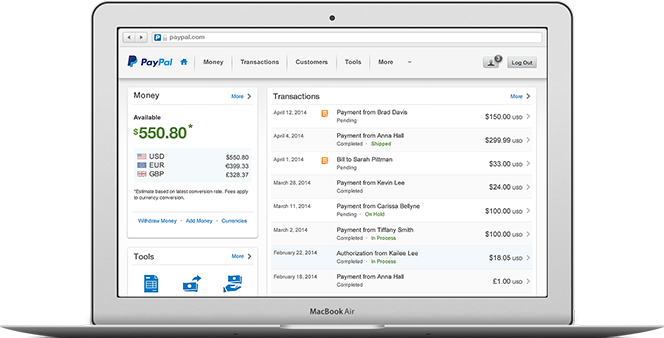 Optimize your business with your PayPal account. Set up your account and choose your payment solution. Start selling and reach millions of buyers worldwide. Enjoy peace of mind. Seller Protection safeguards your eligible transactions with fraud protection, 24-hour monitoring and advanced encryption. Keep your contact and business details up-to-date. Allow multiple staff access your PayPal business account. Tailor your selling tools. Track and measure your business performance from a single account. Create a professional invoice template in minutes. Add your logo and a Pay Now button, and you can send it easily. Leverage our branding and integrate a simpler and safer checkout. Your customers will be delighted. Let our logos and banners inform your buyers that you have chosen PayPal to process their payments more safely. Once you’ve verified your linked card or bank account, you can send, receive and withdraw money to and from your PayPal account.